My grandmothers were the most influential of my grandparents. I had 3 grandmothers since my father had been killed in World War II and my mother had remarried. My step-grandmother had little influence on my life. She was pretty aloof and I don’t remember her paying much attention to me or my brother, who was her full-blooded grandson, so it wasn’t that I was a step-grandchild that affected that. My other two grandmothers were very influential in my life. Grandma Starkweather lived with me all my life until she died a couple months after I graduated from college. Her influence was probably the most impactful but I must tell you I’m not sure where her influence ended and my mother’s began. They were both powerful influences in my life. Grandma Starkweather was my safe place to fall. She had the whole upstairs to herself although she was a part of family life downstairs most of the time. She had a job, then came home and helped with the cooking and housework. She was always available as a good listener and support and, when I needed a quiet moment, I could go upstairs with her. I don’t remember what we did up there, I just remember the warmth of her embrace and her calmness and peace that helped me settle down. She may have imparted wisdom but I don’t remember that, I just remember I know I was loved, supported, encouraged and safe with her. I could tell her anything. Grandma pushed me to do well in school. She offered monetary rewards for good grades. I also remember that when I would get nervous for finals she would go out in the back yard and bring me back a four-leaf clover. I don’t know how she did it but each year at test time she found one! Now I don’t want you to think that this was in anyway a superstition or anti-God in anyway. It was a physical, visual reminder that my Grandma was praying and believing that I could pass these tests with good marks. She was always rooting for an A! I knew that she was praying for me. Both my Grandma and my Mom made sure that religious instruction was also a part of my life. They made sure that I went to Sunday School each week. Then we all met for the church service afterwards. They were not good at sharing their personal faith, but they wanted me to make it a part of my life. Although I did not understand the salvation message then, I am thankful for all the Bible story background and the opening of my heart’s desire for more. There was never any question in my mind that God was there, which later made it easier to surrender to Him completely when I finally understood the salvation message. My Grandma Noble was different. She had had 10 children and so I had lots of cousins, most of whom I never knew very well. I loved her very much and one of my most treasured pictures is of her and I after my 6th grade graduation. I never had much time with her, but once each summer I did get to stay overnight with her at her house when my Aunt LuElla who took me to the Gerry rodeo. My strongest memory was when I begged my Grandma to let me come for a weekend when I was in Jr. High. She finally agreed and that special time is still the clearest memories I have of her. It is a warm and special memory as she told me stories of my Dad when he was young and promised me that when she died I would receive the barn and animals he played with as a little boy. I still treasure that barn. Grandma Noble was radically saved as an older adult and attended a Pentecostal church, but she like my other grandmother did not discuss her faith with me. I do know that she prayed and I believe she prayed for me too. Looking back I see my inheritance from them as non-tangible, emotional, spiritual, supportive influences of good women living good moral lives. I knew they loved God. I knew that they didn’t have much money to share, but I didn’t want that anyway. I just wanted to be a part of their lives and for them to hug me, love me, and make me feel like I belonged to something bigger than myself. It is what family does for us. It gives us identity, support, a feeling of belonging, a reason for being, and a hope of life continuing into the future…eternity if you will. We are creating an inheritance too. There seems to be an increase in a desire to know who our ancestors were. Some have spent time searching out their roots to find that they are related to a royal line. Personally I’m not much interested in searching for my roots as I know some of my relatives were poor sinners and the only royal line we are connected with is the Lion of Judah, which by the way is a pretty good line. Anyway I’m not saying that those who enjoy searching their ancestry line are silly or doing anything wrong. They are not, it’s just “different strokes for different folks.” That just isn’t interesting to me at this time. 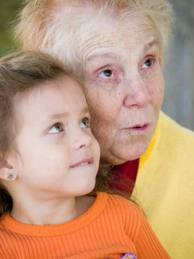 I have young grandchildren and I want to give them a good and lasting inheritance. Right now I live close enough to spend some real quality time with them, but the truth is I have learned from my own grandmothers that it isn’t necessarily the number of times you get to spend with one another, but the love, understanding, listening, and praying that is remembered from those times you are able to connect: that warm, happy feeling of belonging. Today those memories may not take place flesh to flesh, but over the telephone, Skype, FaceTime, or Facebook, or a sent letter or e-mail. Let me just encourage you to take the time. One thing that I am trying to do differently though, is I am being very open with my faith with my granddaughters. I pray with them as well as hug them, listen to them, and share my wisdom with them. The spiritual aspect of our relationship is as important as the emotional and physical ones, so I try to do them all. Now I know that a lot of you are further along in this grandparenting thing than I, and some whose children and grandchildren have made bad choices are a deep hurt. Please don’t spend your time wishing you had a greater impact or could do something to change their choices. Love them anyway and pray for them everyday. I promise you that they know what you stand for, hopefully you walk that out everyday, and you being a part of their lives brings an inheritance that you and they may never be able to fully grasp. Let’s just trust the Lord that He will use whatever you have given and will give to your children and grandchildren in the physical, emotional, spiritual, and financial areas of their lives will be blessed, broken, and multiplied into your children’s children’s lives and continue on until Jesus returns. If you have been more focused on the physical, emotional and financial aspects of your grandchildren’s inheritance, maybe this will remind you of our call to the spiritual, which really can only be effected by the faith-filled, continuous prayer of a righteous man or woman. (James 5:16) Pray on, Grandma.